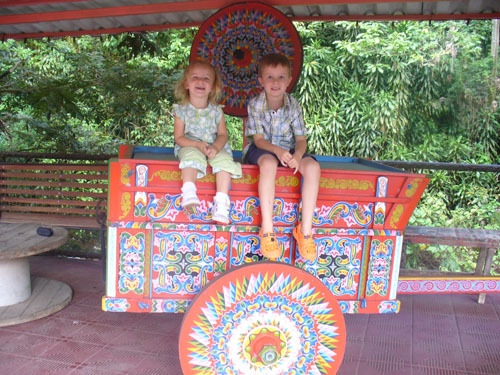 Charlotte and Max on one of the famed Sarchi oxcarts. Lovely day today as we got to show Grandma around a little. She arrived Thursday evening (well Friday morning at 1 a.m.) more than four hours late due to bad weather in Houston. Yesterday we let her relax a little and only hit the grocery store but today we went into tourist mode. We went up to a neat little town located in the middle of coffee fields and, when following the GPS, accessed by dirt and winding roads. There was an outside market with various stalls of plastic (made in China) toys and jewelry, leather goods, and interesting sweaters and hats which we discovered were made in Ecuador. Charlotte got some lovely little leather sandals which will hopefully stop smelling like wet dog soon! We also bought her an adorable zip up sweater that has little animals appliquéd over it. These are hand knit sweaters and even include little romping llamas – very cute. Prices were OK ($13) for the sweater but once some of the stall owners saw we were open to purchasing then items seemed to increase. Adult sweaters (factory and not hand made) became $30 even though original quote was $10. Dad and Charlotte on the restaurant playground. 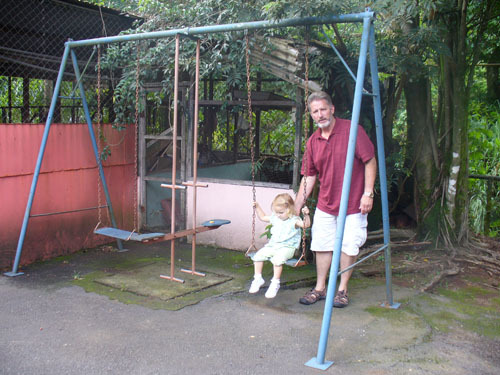 Note the swings on concrete — a normal thing here. We were at the tail end of the vegetables but by the debris and number of empty stalls there must have been a good number. 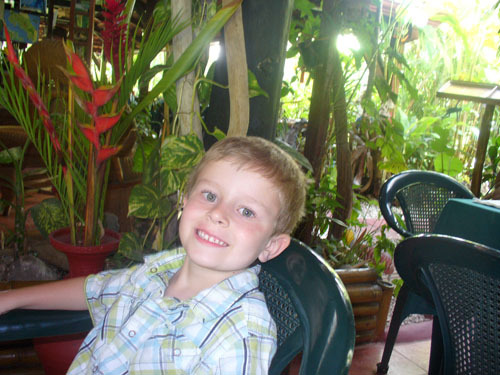 So from there we went on to Sarchi which is the furniture and craft capital of Costa Rica. Lots of artisans work from there and the shops were full of heavy wood furnishings – dark and heavy look to most items but very pretty. We had lunch at a riverside restaurant that we had discovered a few weeks ago when Jacob was still here. El Rio restaurant is next door to a big souvenir shop which is convenient. The restaurant has the same fare as the majority of other places here; corvina (sea bass) in various forms, expensive shrimp in the same forms, salads, soups, and ceviche (something all of us love here). Good food but not great for $55.00 lunch. We picked up a few bits and pieces in the souvenir shop. There are limited items made in Costa Rica and most of the souvenirs are actually made elsewhere, printed with “Costa Rica” on the front and shipped in. But of course magnets and T-shirts are available and given the low baggage amounts on airlines it’s a good thing to limit shopping now. 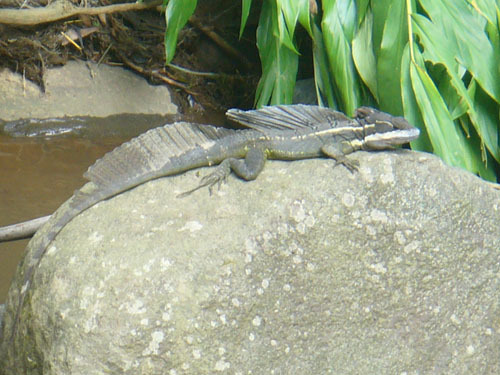 The river next to the restaurant has lots of lizards around it. Our exit was marked with a thunderstorm that unleashed a huge volume of water on the roads. Quite stunning to see how full the drainage ditches become and how rivers of water suddenly spill out of fields making the roads brown streams. Socializing is a big part of life here in Costa Rica and there seems to be more local bars than restaurants. Here is one that makes me smile as the horses are tethered outside. We’ve seen this in a few of the more rural places. Not sure of the drunk riding laws! And speaking of road hazards, we have frequently had to slow down because horses, cows, and even a goat or two were wandering across the road. 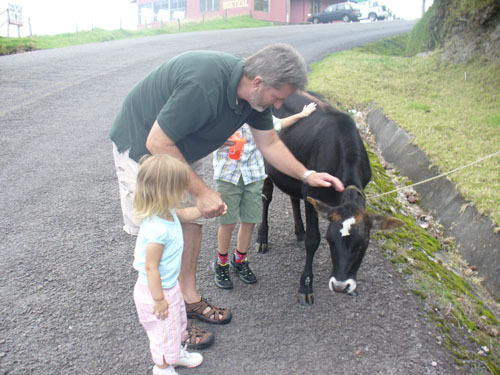 This calf was tethered outside a restaurant we stopped at near Poaz Volcano. It craved attention from the children and made the loudest, wailing noise every time we walked away! Amazingly we have only seen one animal, a dog, that had been hit on the road. We spent a lovely half day at the Bosque del Nino or Child’s Forest which is a 40-hectare park just outside of Grecia in the central valley area. It has a grassy picnic area and small play ground plus these neat little elevated children’s picnic platforms. There are trails around the park with the main one about three kilometers. We went on the “easy” path that was about 800 meters uphill to a look out point. 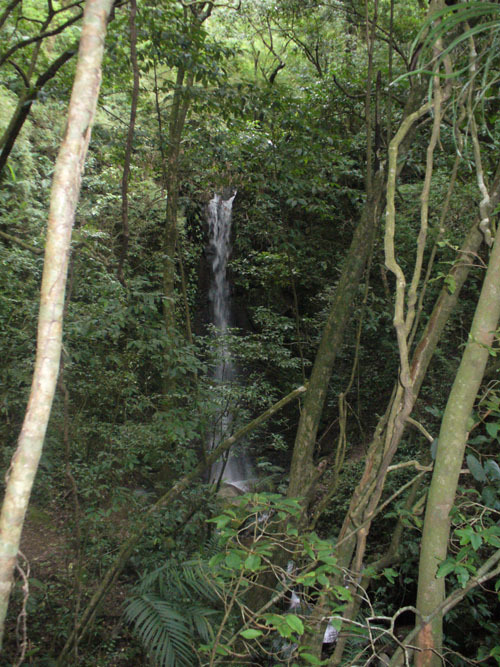 From there it was another 650 meters to a waterfall. Setting off 800 meters didn’t seem far but when a 35 pound two-year-old conks out and demands (through shrieking and sobbing) to be carried up the hill which was quite steep in places and slightly slippery with wet leaves, it feels more like climbing to base camp on Everest! We made it to the look out point and then the little ones and I collapsed on the bench while dad jogged to the water fall. Going down was much more fun as Charlotte decided she would walk! The trails were easy and safe enough for children and similar (little harder) to our loved Ijams Nature Center in Knoxville. 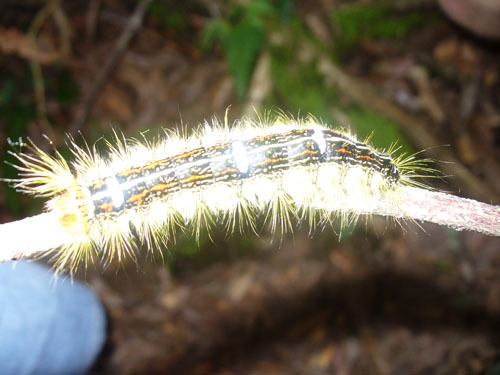 We spotted a couple of brightly colored and spiky caterpillars, lovely butterflies, and the tail end of a squirrel but that was all. That could have been due to my heavy gasping carrying Charlotte uphill or the non-stop chatter of children as apparently there is a wide range of animals often spotted in the area. 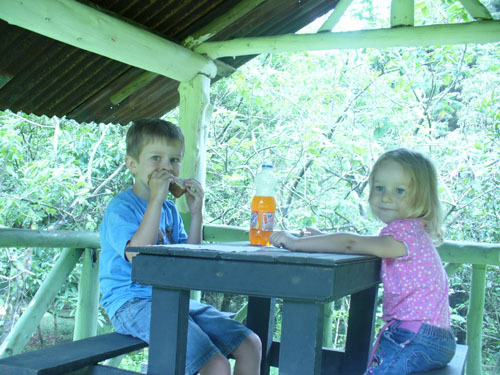 There were quite a few Tico families picnicking in the grounds and even barbecuing which looked fun – but our cheese sandwiches were tasty too! 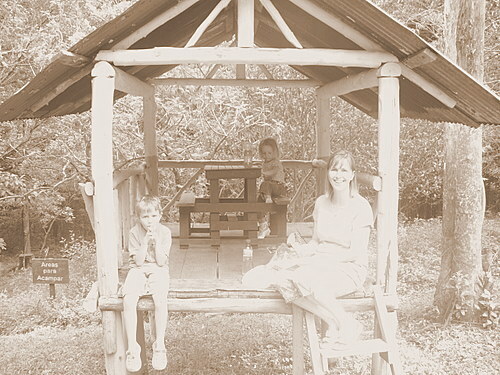 The trip up to the Children’s Forest passes through intense coffee growing country. Our GPS route tends to put us on the most direct path rather than the biggest and widest roads which means we have seen some interesting and narrow country roads (dirt tracks in places). 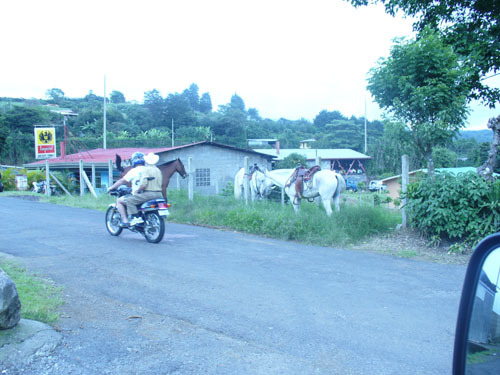 The hillsides in that area are densely planted with coffee plants dotted with large palm and banana trees. We also drove past a huge farm with fields covered in netting under which were growing hundreds of Boston ferns – now we know where all those hanging on Southern US porches come from. Never having stayed at an inclusive resort before we were quite amazed at the level of organization required to check in. We were all stamped and branded with non-removable arm tags that designated we were official and which of us could drink etc. We had maps and lists of activities and little cards to check out towels (do not lose these or you pay dearly), and times and restaurants we were to eat at. 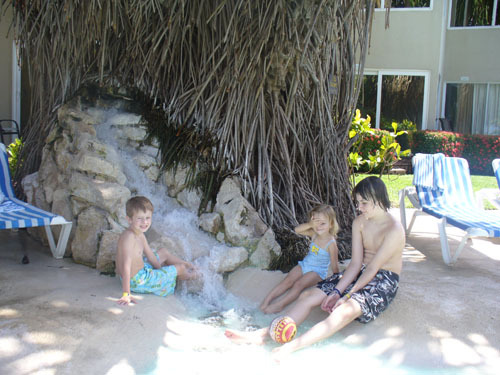 All very mind boggling but we quickly settled in, changed and hit the pools. So for the next three days we did nothing but lounge around the pool, stand and look at the beach, walk along the peer, and eat. No driving, no trying to find places to park or shop; just sheer indulgence. 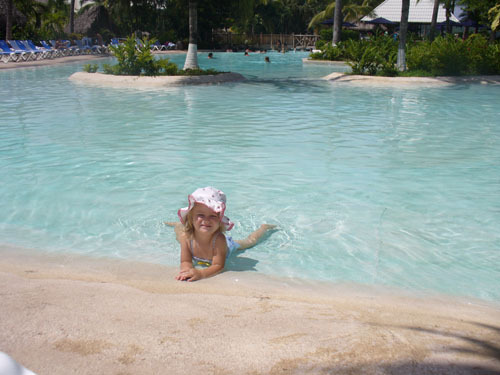 The pools were lovely with lots of shallow areas for little ones, big palm trees for some shade, little waterfalls and huge iguanas to keep things interesting. There were lots of families and children around. Hard to say where everyone was from but 90% Spanish speaking and about 10% American. It was often easy to spot the Americans as they were the ones NOT wearing string bikinis and Speedos. Being European I remember skimpy swimwear but usually that was on very tiny French folks. Central Americans seem to have a good sense of self and are comfortable with much larger bodies being exposed in much larger ways. In fact larger, rounder bodies are supposed to be more attractive. Personally though I feel that when a Speedo or sting bikini bottom actually disappears from sight upon wrestling it onto a body, it is perhaps time to rethink that fashion style. But the comfort with body was really good when it came to babies. I saw lots of little ones being openly breastfed right around the pool and even while walking into dinner. Swimsuits are easy to accommodate little one’s lunch. That is lovely to see after so many repressed and uptight countries we have lived (and nursed) in! OK so the pools were lovely and thank goodness. The beach was even worse in this area of Puntarenas. The hotel bills it as black volcanic sand but having been on similar beaches before I am skeptical that this black muddy stuff was simply volcanic sand. Two rivers empty into this part of the ocean and the water is filled with churning black silt and huge pieces of trees and logs that kept rolling and crashing onto the beach. The waves were pretty big and that plus the log pieces made for no swimming. You didn’t really want to sit on the sand as it just seemed to turn to muddy yuck. But there was a long wooden pier and do we walked that a few times listening to crashing waves underneath us. There was a Kid’s Club with some very hyperactive young men blowing whistles and shouting and leaping everywhere. My kids took one look and said no thanks. They did end up going on the huge inflatable water slide a few times and enjoyed that. Max (5) went the first time and since he is a bit tentative about wild rides or thrills I was stunned that he just climbed right up. I watched his face as he shot down the 15 foot drop on the other side, went airborne and then hit a pool of water. It was a riot as all you could see were these huge eyes and look of horror as his little skinny body shot down this slide. He scrambled out of the pool, shaking with adrenalin. The camp counselor raced and gave him high five and leaped around Max saying how great he did. Max stunned me by heading right back on two more times and even took his brother Ben on the next day! Accomplishing that was very empowering for him, so much so, that he decided he was going to learn how to jump off the side of the pool and even get his face under water. And learn it he did! He’s so proud of himself it’s wonderful to see. The first thing he did when we got home was Skype his big brothers to tell them all about it. Now the down side of making friends with the camp counselor was he told Max about the big kid’s show in the theater that night. We’d been briefed that each night there was a big show with varying themes but hadn’t opted to attend. Still that night Max made us as he’d promised his buddy he would go. And then Max made us sit through the whole hour of song singing and dancing – none of which he understood as it was all in Spanish. The guys had all the children up on stage dancing and playing games. It was noisy but fun. Max claimed he didn’t know there would be a disco and so hadn’t practiced his dancing therefore he couldn’t go up on stage (yeah like if he practiced he’d really go!) and Charlotte just clutched us in horror. But they enjoyed watching and being rather interested in child development I found watching the parent/child interactions fascinating. I mentioned the food already and yes there were quite a few restaurants and bars. Drinking seemed to be high on the list for quite a few folks but we didn’t see anything negative. The food was OK. Not thrilling but for buffets and feeding lots of people it was alright but nothing to draw you back. One night we ate in the Italian restaurant that had menus and waiters etc. That was more relaxing than buffet but the food again was just OK. I had shrimp over fettucine but the shrimp were overcooked and a bit rubbery. The calamari we all looked forward to was rubbery and the batter fell off in your hands. I would say better “Italian” food at an Olive Garden (sorry Hilton). But you couldn’t be upset as the waiters tried so hard and were so nice and friendly. Everyone here is but there the staff seemed especially nice (and not obsequious just friendly). We did have an unpleasant run-in with a “local” when we were walking along near the beach about 8pm one evening (black dark here by 6pm as we are near the equator). A dark animal shape ran towards us and kind of circled. Mark thought it was another coatimundi as we’d seen in other places but as it got closer he realized it was a huge rat and he had to reach his foot out and try and kick it away. The thing leaped up a nearby palm tree and we raced off. I am still a bit stunned that rats are that big! Think they must like the Hilton food a little more than we did! 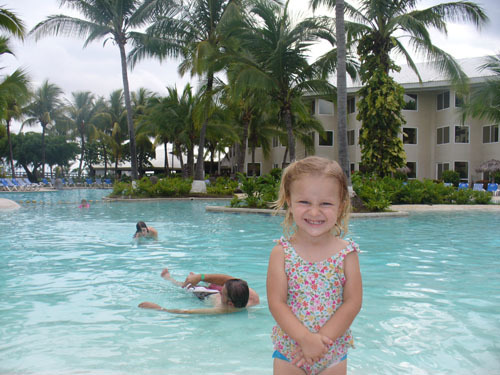 Anyway it was a lovely break and fun to swim in the pools and just relax doing nothing. I assumed my normal position on a deck chair with a book and this time I added drinks with lovely chunks of fruit in them. Total bliss! Another week, another beach – life is hard here in Costa Rica! We just spent a few days in Puntarenas which is about 2 hours drive from Heredia and our house and is really the closest beach to San Jose. It was an easy drive despite being near the horrific road works we were trapped in for 5.5 hours on the way to Monteverde. Thankfully that bridge seems fully repaired. Puntarenas actually is not renowned for its beaches but is more of an overnight stop when you catch the ferries to Guanacaste (we are doing that in about 2 weeks). We drove into the main town and were not overly impressed. 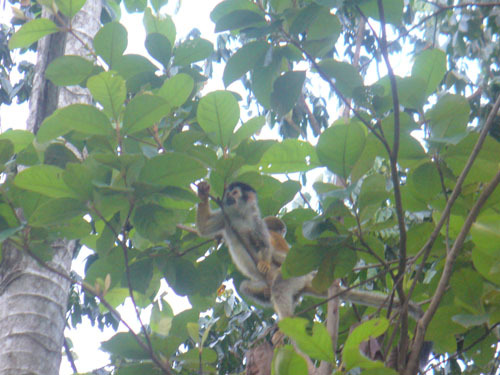 It is a long, thin town with beach to one side and inlet/mangrove swamps to the other. Sadly, very impoverished looking and not at all as well kept or cared for as most of the other towns we have seen here. The long beach road had park-type areas along the beach and small hotels/restaurants on the other and was described in a travel book as looking like a 1950s town in Florida. Being beach lovers we parked and jumped out to run on the near-deserted beach. Hmm. The sand was quite dark and dirty looking and the whole beach was full of debris – some natural and some not. But more unpleasant was the vast amount of broken glass from beer bottles over the walkways and dune areas. We opted not to stay on that part of the beach. There was a long pier for the cruise ships (none of which were around when we were there) and a handful of small beachside restaurants complete with plastic covers and chairs and the ubiquitous old video games and toddler rides. I remember Italy from years ago having almost the exact same little restaurants but in my memory the food was better. We managed juices and cheese sandwiches – an interesting white cheese that is fried and then slabs of mayonnaise placed on the bread. We have discovered this is the sandwich you get if you order queso blanco. If you order queso amarillo (yellow) you get unheated squares of yellow cheese and mayonnaise. It’s fairly limited fair for vegetarians! Anyway we had a relaxing lunch and then drove a few blocks down to the excitement for the afternoon; the aquarium. The Parque Marino del Pacifico is apparently the only aquarium in Costa Rica. It has 28 tanks and on quite a large area across from the ocean. We seemed to be the only visitors but it was cheap at $12.00 for the family. While not exactly riveting and thrilling it was sweet and OK entertainment for 30 minutes or so – not worth a drive to but if you are in the area a good stop. 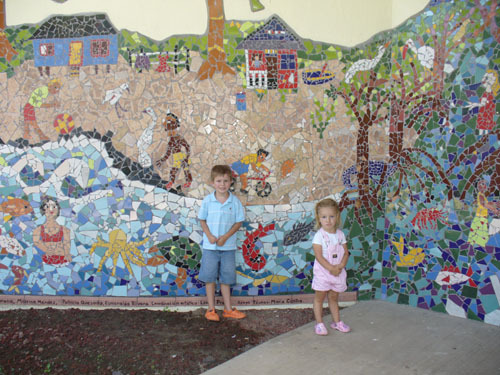 They did have this amazing mosaic wall. So then it was on to our hotel. Here’s the confession time. I had seen a big ad for the Hilton Doubletree Resort which is all inclusive with food and drink plus four big pools and kid’s club etc. I checked out the price and it was the same darn amount to stay there (with food and drinks included) as it is to stay in locally owned hotels here (no food included). So we decided to fund Paris’s next wild parties by adding our dollars to that fortune. Not the most locally minded but for the same price we got HOT water, no ants or wild bugs, soft downy pillows and duvets, and more. A few more pictures of Poaz Volcano. Ben took this of a neat rock formation down in the crater. By Ben Green (age 13). This is me in front of Crater Lake. 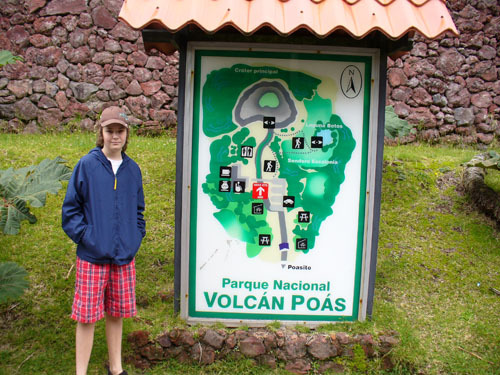 Poaz Volcano is a wildlife park full of birds, Costa Rican squirrels (they are very tame), lizards and larger than life vegetation. The main path up to the crater is actually very short and easy to walk on. We just accidentally took the long route. But in that route we saw many a bird and squirrel and plant-life. 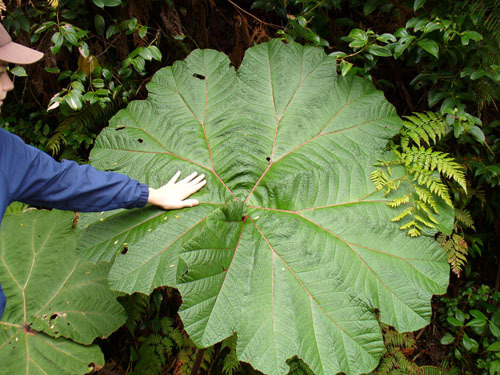 The plants are huge up on the slopes of the crater. One leaf was bigger than I was! On the trail we ran into a very long staircase and by the time we were up it we all had to rest. The crater itself was probably the best part of it. Inside the crater there was an acid lake that was magnificently turquoise, and you could see the steam coming off the surface of it. But surrounding there were giant cliff-side’s that were so high that when we stood on top of it we could see for miles! We could see some houses and farms and the old lava flows were black and burnt but you could still see the ripples. I took this cool picture of a rock formation. 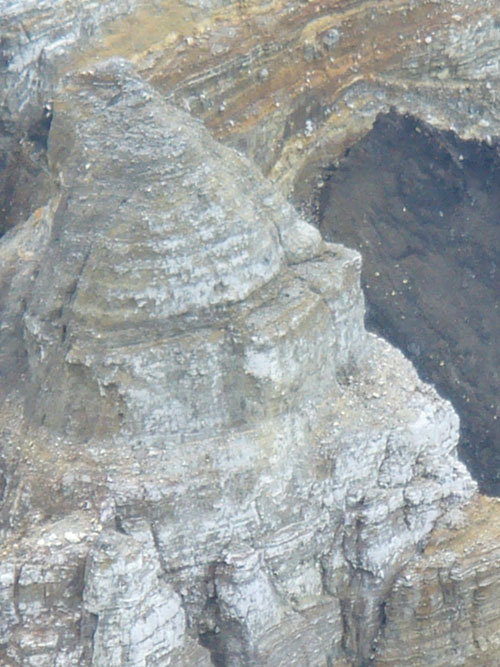 More info: Poaz Volcano is somewhere around 2550 meters high; at least that’s what the car’s altimeter said. 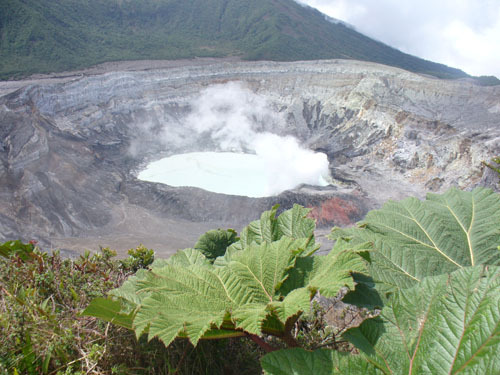 The old crater is filled up with rain water making a natural crater lake. The only thing that lives in the Crater Lake is algae because it is so acidic. 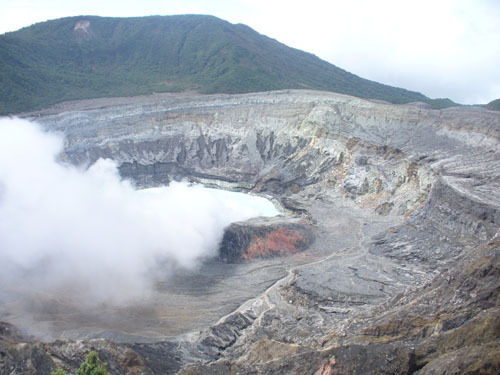 The crater itself is 45 celcius hot! And again obviously the only thing that lives in it is algae. The Crater Lake is named after the Indian tribe of Pothos. They lived on the shores of it. I do not know why because they probably could not drink it because of the acidic waters, and there were no fish thanks to the acid. 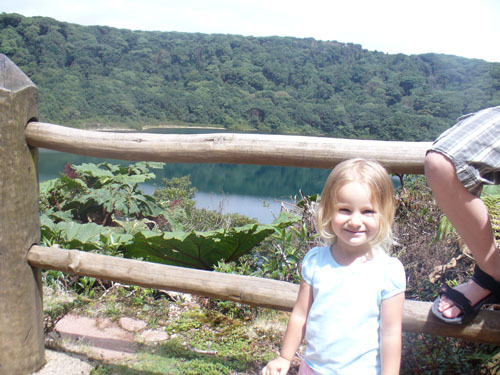 When I first saw the actual crater I was overwhelmed…..by heat that is! It was quite warm on the observation deck and we could see birds sweeping back and forth over the steam and lake. 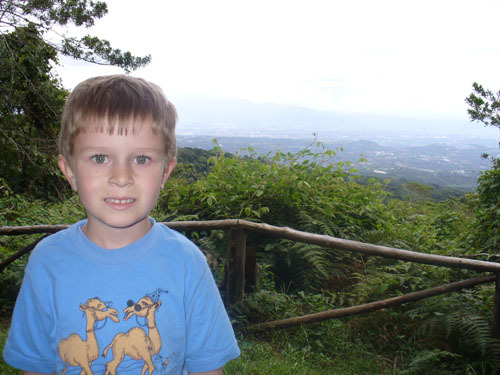 Just before Jacob left we had a fun visit to Zoo Ave which is just south or so of Alajuela. 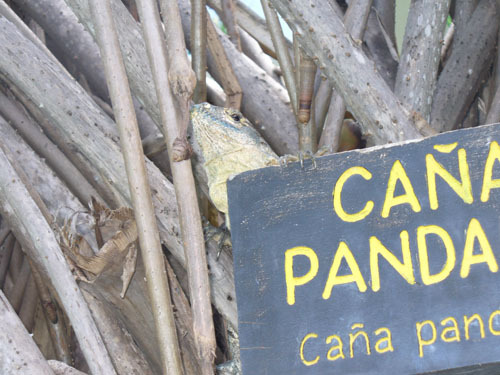 This is a neat little zoo that focuses on rehabilitation and education about conservation etc. Jacob as always managed some neat pictures – the signs were interesting. 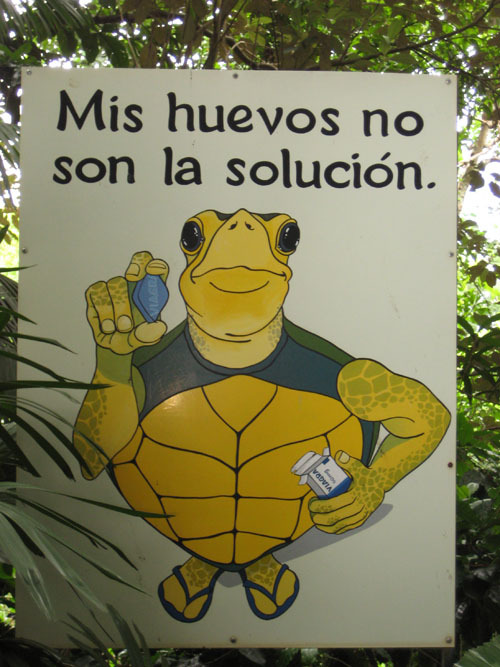 The second one states “my eggs are not the solution” and the turtle is holding a Viagra pill. 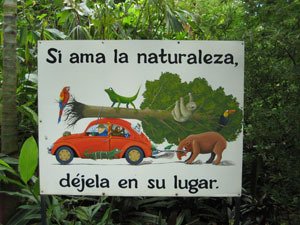 Interesting for a zoo. 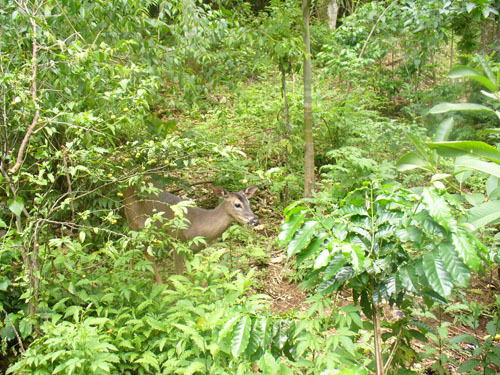 I hadn’t realized there were deer in Costa Rica but we’ve seen them at a few nature park places. Spread over the lush grounds of Zoo Ave is a collection of large cages holding toucans, hawks, parrots, and even two quetzals (the macaws range free), not to mention crocodiles, turtles, monkeys, wild cats, and other interesting critters. The zoo, the best in Costa Rica, runs a breeding project for rare and endangered birds, all of which are destined for eventual release. It has a total of 120 bird species, including such rare ones as the quetzal, fiery-billed aracari, several types of eagles, and even ostriches. An impressive mural at the back of the facility shows Costa Rica’s 850 bird species painted to scale. 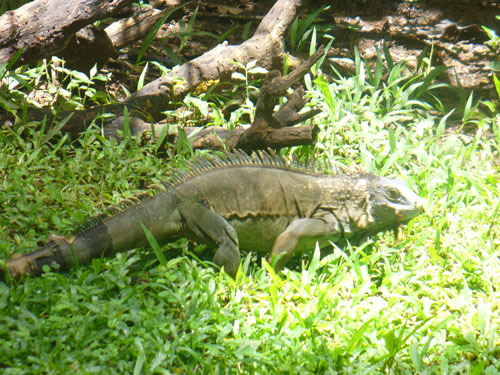 We did see many large iguanas running around freely. Again this is common. 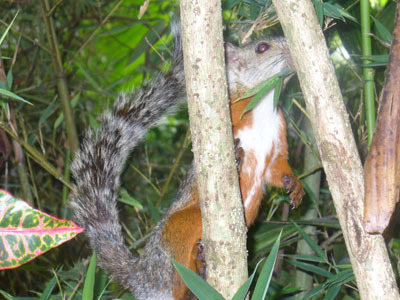 We were told the green ones are kept as pets by many people here but not the brown ones as those are more aggressive. 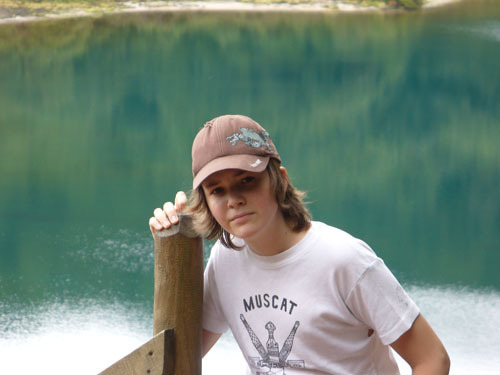 My oldest son Sam had a green one that was about 3 foot long about 10 years ago (Lizzie) and that thing was so evil I cannot imagine anything more aggressive. Sam used to suit up with a snow jacket and snowboarding gloves and goggles just to try and lift her out of the cage! We lived in fear of her for a couple of years! Sam we think of you every time we see these. 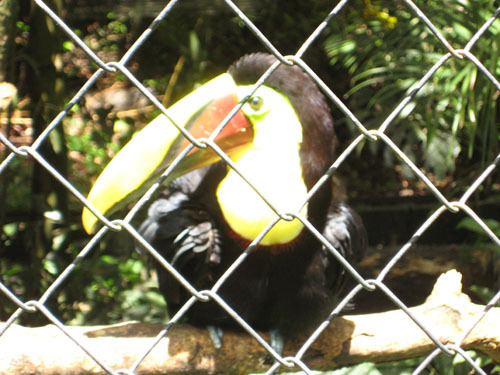 And of course toucans. We have only seen two flying at the beach but we do see lots of parrots around. There were about five of them squabbling and fighting for a spot on a power line right above the grocery store in Santa Barbara the other day. We were the only ones looking at them and taking photos. Geeze tourists! Our rental house is in a complex of 10 new houses inside a small and beautifully manicured complex. Disconcertingly in some respects we have an armed guard at the gatehouse and none of the houses have ever been robbed. Still the idea we need to be protected with a gun is not comforting to those of us with pacifist leanings. Considering the country is renowned for peace and not having a military, we have seen more people carrying guns than Texas! It’s the same at restaurants. We just ate at a Chinese restaurant at the bottom of the “hill” (namely Barva Volcano) and it was delicious with lots of fresh vegetables in rich sauces but not a fancy or overly expensive place. Our car was parked right in front of the restaurant but even there they had a guard with a huge night stick (some have guns as well) who patrols the small parking lot and then helps people back out into the road. I am not sure if the guards are always necessary (my Pollyana attitude hopes not) or if the presence of a guard notches up the restaurant status as well. We have not experienced car break-ins but our rental SUV doors look as if they have been pried upon previously as one is bent slightly and the other badly scratched around the door lock. From what we hear it is a common thing to happen. We also discovered from watching other diners that they tip the security guards as leaving. One of the things in travel is having to watch and take notes of local customs — hopefully we are getting the amounts right! No one has glared at us yet. Even non-compound houses here are well protected with tons of metal bars on windows and around patios, barbed wire, broken glass glued to wall tops, and padlocked everything! Add the dogs on just about every patio and it must be tough to be a burglar. I’ll post some pictures of regular houses but we think this one is particularly interesting. 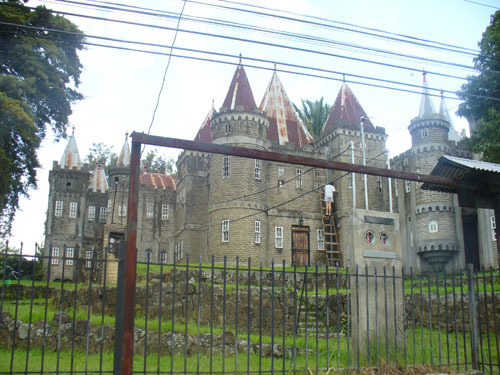 It’s near our favorite grocery store and as you can see is a castle! The pointy roof parts are actually metal so it’s built with normal local materials but just in different form. The kids think it is very cool. The next morning it was drizzly rain but we had a delicious breakfast (all the restaurants are covered but open plan so they can be a bit warm as it is much hotter and stickier in that region) of mango pancakes and omelets this time. Max in Mono Azul Hotel restaurant. Then we loaded up and headed home, stopping in Jaco to see what that beach was like. 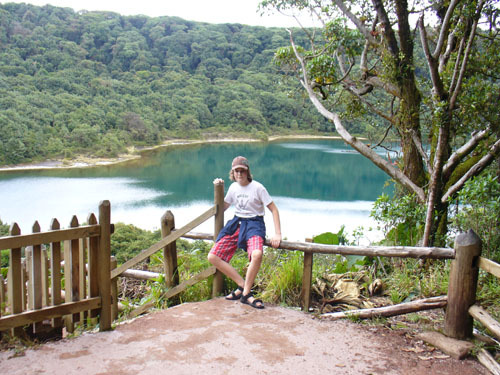 We had heard this is the “Myrtle Beach on spring break” town of Costa Rica. There were lots of half built condos and a road full of ice cream shops and bars. The beach though was not impressive as the sand is black silt and rocky from local rivers that pour into it. A local American woman we met said the area was nice except for the profusion of bars and prostitutes. We ended up not sticking around and drove home – happily arriving back before the heavy rainstorms that hit again last night. A good trip but financially heavy. At $170 a night for the hotel plus expensive places to eat, these short trips take a toll on the budget. And we certainly are not staying in the expensive resorts or eating at the priciest restaurants. Certainly not as reasonable to be here as we had hoped – oh well still lovely and we shall keep on exploring. 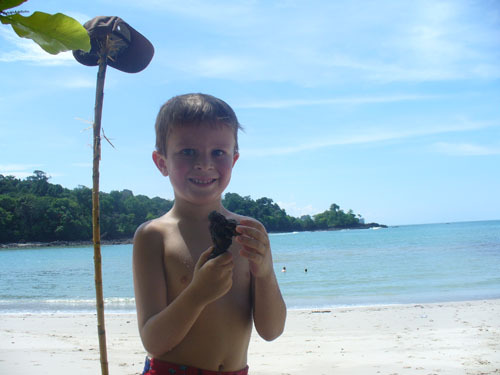 Max wanted this photo in — he is holding a beautiful piece of coral but sadly the colours didn’t come through.